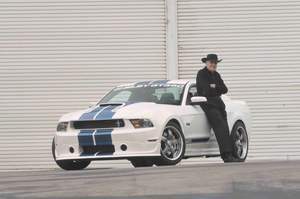 GARDENA, CA--(Marketwire - January 20, 2011) - Racing legend and automotive icon Carroll Shelby will be honored at the Washington Auto Show on Thursday, Jan. 27, in Washington, D.C., where he will receive the 2011 Keith Crain/Automotive News Lifetime Achievement Award. The award is given annually to an individual who has made a significant contribution to the auto industry. He is the third person ever to receive this award. Previous recipients include auto safety pioneer Ralph Nader and U.S. Rep. John Dingell, D-Mich.
"I'm honored to receive this award from my good friend Keith Crain," said Carroll Shelby. "It represents all of the hard work put in by people at Shelby over the years. I've been blessed to be surrounded by so many over time. They deserve this award as much as I do." Proceeds from the dinner will benefit the Automobile Dealer Education Institute (ADEI) and the Carroll Shelby Foundation. The Carroll Shelby Foundation was founded by Mr. Shelby to provide financial support for children battling life-threatening illnesses and promote continuing education. "This is a great honor for Carroll and a well-deserved award for his contributions to the industry," said Jenni Shreeves, director of the Carroll Shelby Foundation. "Carroll isn't receiving this award only for his designs and innovation, but also for his drive to help children in any way possible, from donating a car for a fundraiser to offering students a chance at an automotive career by attending the Carroll Shelby School of Automotive Technology. We're changing lives." There will be a collection of vehicles featuring Mr. Shelby's creativity and designs from the past and present at the award ceremony. Guests can purchase tickets and register for the reception and dinner at https://www.regisys.com/AUTO11pre/Start.asp or contact Kristina Henry at kh@wanada.org. Attendees must RSVP by Jan. 21.